It's been a year since Google underwent a major corporate restructuring into the entity known as Alphabet. 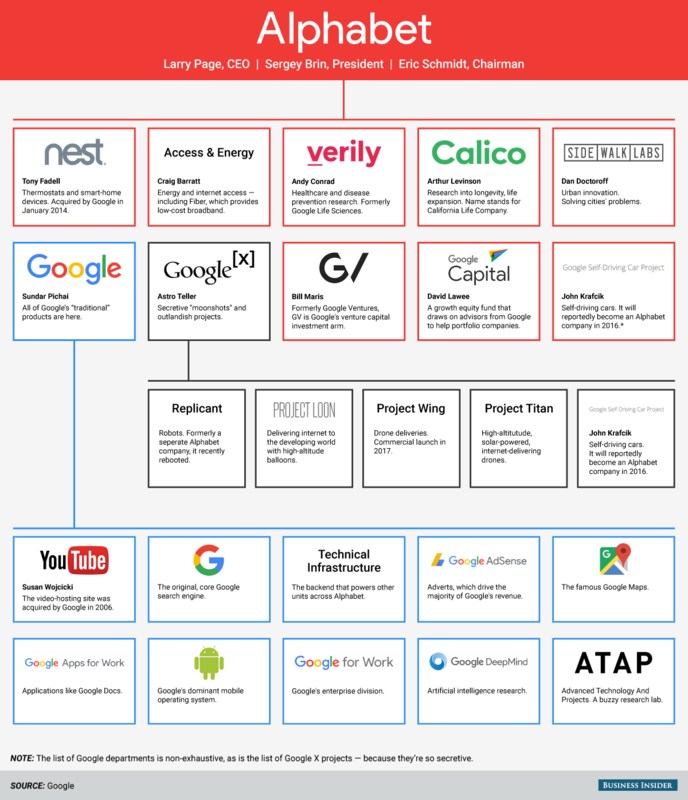 Google became a wholly owned subsidiary, as did other Google services, projects and teams which were re-created as separate companies under the Alphabet umbrella. The goal of the change, they said, was to allow those in charge more freedom to seek new projects and make acquisitions outside of Google's mission "to organise the world's information and make it universally accessible and useful." What makes a prospective Alphabet company attractive to these experienced acquirers? I think innovation and profitability are two of the factors that clearly unite the companies under the umbrella so far. The largest component of Alphabet is Google, which includes YouTube, Google Search, Google Apps and a fistful of others. Nest, acquired by Google in 2014, develops smart home devices including thermostats, smoke alarms and security cameras. Access & Energy aims to bring low cost Internet to the two-thirds of the world which still has no Internet access, thereby expanding its market--and earnings! Health and disease prevention oriented verily uses technology to prevent, detect and manage disease. Google Ventures and Google Capital are finance-based companies, and the Google Self-Driving Car Project, which is supposed to become a company in 2016, is self explanatory. The final company under Alphabet is the most secretive and possibly the most interesting of them all: Google X is a secret lab under the direction of scientist Astro Teller that works on "moonshots" and outlandish projects. How outlandish, you ask? Media reports credit this innovation lab as working on everything from space elevators and teleportation to hoverboards and driverless cars. How about drone deliveries via Project Wing? There's also Project Loon, an improbable scenario using high altitude balloons to create an aerial wireless network for vast unserviced areas of the globe. This may all sound crazy, but it wasn't so long ago that radio was a crazy dream. So was television, never mind the Internet. Every great innovation begins with a dream, is followed by experimentation and failure, and eventually (with luck)--success.